Since she burst spectacularly into view with her debut novel almost two decades ago, Zadie Smith has established herself not just as one of the world's preeminent fiction writers, but also a brilliant and singular essayist. She contributes regularly to The New Yorker and the New York Review of Books on a range of subjects, and each piece of hers is a literary event in its own right. Arranged into five sections--In the World, In the Audience, In the Gallery, On the Bookshelf, and Feel Free--this new collection poses questions we immediately recognize. What is The Social Network--and Facebook itself--really about? "It's a cruel portrait of us: 500 million sentient people entrapped in the recent careless thoughts of a Harvard sophomore." Why do we love libraries? "Well-run libraries are filled with people because what a good library offers cannot be easily found elsewhere: an indoor public space in which you do not have to buy anything in order to stay." What will we tell our granddaughters about our collective failure to address global warming? "So I might say to her, look: the thing you have to appreciate is that we'd just been through a century of relativism and deconstruction, in which we were informed that most of our fondest-held principles were either uncertain or simple wishful thinking, and in many areas of our lives we had already been asked to accept that nothing is essential and everything changes--and this had taken the fight out of us somewhat." Gathering in one place for the first time previously unpublished work, as well as already classic essays, such as, "Joy," and, "Find Your Beach," Feel Free offers a survey of important recent events in culture and politics, as well as Smith's own life. Equally at home in the world of good books and bad politics, Brooklyn-born rappers and the work of Swiss novelists, she is by turns wry, heartfelt, indignant, and incisive--and never any less than perfect company. This is literary journalism at its zenith. Zadie Smith's new book, Grand Union, is on sale 10/8/2019. 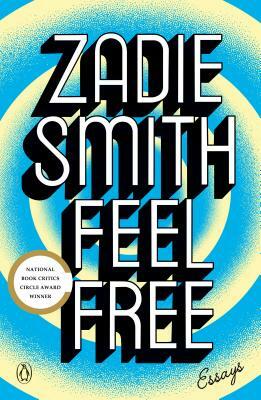 Zadie Smith is the author of the novels White Teeth, The Autograph Man, On Beauty, NW and Swing Time, as well as a novella, The Embassy of Cambodia, and a collection of essays, Changing My Mind. She is also the editor of The Book of Other People. Zadie was elected a fellow of the Royal Society of Literature in 2002, and was listed as one of Granta's 20 Best Young British Novelists in 2003 and again in 2013. White Teeth won multiple literary awards including the James Tait Black Memorial Prize, the Whitbread First Novel Award and the Guardian First Book Award. On Beauty was shortlisted for the Man Booker Prize and won the Orange Prize for Fiction, and NW was shortlisted for the Baileys Women's Prize for Fiction. Zadie Smith is currently a tenured professor of fiction at New York University and a Member of the American Academy of Arts and Letters.